We have two Bolder locations to better serve our customers. Our first location in Boulder Colorado is just east of the Pearl Street Mall, on the corner of 26th and Pearl in the Cox Corner Building. 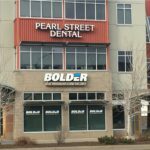 Our Boulder Address is: 2575 Pearl Street, Suite B1. Our second Bolder location is across the street from Memory Square Park in historic downtown Louisville Colorado. 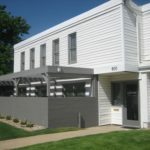 Bolder Insurance is on the corner of Spruce & Jefferson located at 800 Jefferson Avenue. There is free parking in the Cox Corner parking lot, which is located behind the building. The parking has an East entrance from 26th, and a South entrance from Pearl. There are two bike racks right outside the building – on Pearl Street by the bus stop, and on 26thStreet. The Hop Bus stops directly in front of the building on Pearl Street, and across the street half a block away near Mike’s Camera. For more information visit Go Boulder. There is one bike rack available on the outside the building on the left. The Dash Bus stops downtown Lousiville on the corner of Spruce and Main. Boulder Insurance is 2 blocks west on the corner of Spruce & Jefferson. For more information visit Louisville.gov.